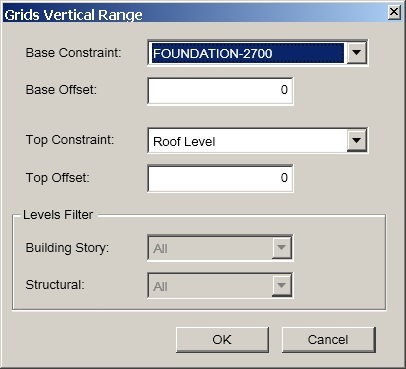 Trim Grids tool works similarly to the Trim and Extend tool of Autodesk® Revit®. With it you can easily trim or extend one or more Grids to a boundary defined by Grid, Level, Reference Plane or Detail Line. Trim/Extend Grid 3D: Trim or extend Grid 3D extents to the reference (Grid, Level, Reference Plane or Detail Line) as a boundary. Grids 2D extent will switch to 3D extent. Trim/Extend Multiple Grids 3D: Trim or extend multiple Grids 3D extents to the reference (Grid, Level, Reference Plane or Detail Line) as a boundary. The extent end of a Grid that is close to the boundary is trimmed or extended. Grids 2D extents will switch to 3D extents. Trim/Extend Grid 2D: Trim or extend a Grid 2D extent to the reference (Grid, Level, Reference Plane or Detail Line) as a boundary. Grids 3D extents will switch to 2D extent. Trim/Extend Multiple Grids 2D: Trim or extend multiple Grids 2D extents to the reference (Grid, Level, Reference Plane or Detail Line) as a boundary. The extent end of a Grid that is close to the boundary is trimmed or extended. Grids 3D extents will switch to 2D extents. Set Grids 3D Height: Set Grids 3D (model) extents in vertical direction by defining levels and offset. Trim Levels tool works similarly to Trim and Extend tool of Revit. With it you can easily trim or extend one or more Levels to a boundary defined by Grid, Reference Plane or Detail Line. Trim/Extend Level 3D: Trim or extend Level 3D extents to the reference (Grid, Reference Plane or Detail Line) as a boundary. Levels 2D extent will switch to 3D extent. Trim/Extend Multiple Levels 3D: Trim or extend multiple Levels 3D extents to the reference (Grid, Reference Plane or Detail Line) as a boundary. The extent end of a Level that is close to the boundary is trimmed or extended. Levels 2D extents will switch to 3D extents. Trim/Extend Level 2D: Trim or extend a Level 2D extent to the reference (Grid, Reference Plane or Detail Line) as a boundary. Levels 3D extents will switch to 2D extent. Trim/Extend Multiple Levels 2D: Trim or extend multiple Levels 2D extents to the reference (Grid, Reference Plane or Detail Line) as a boundary. The extent end of a Level that is close to the boundary is trimmed or extended. Levels 3D extents will switch to 2D extents. Switch Bubbles can show or hide multiple Grids/Levels bubbles according to a boundary defined by Grid, Level, Reference Plane or Detail Line. The free ReviTea Grid/Level add-in is brought to you by ReviTea.